This web page is about saving money on cell phone service plans used primarily for voice calling. If you're interested in Web access using a smartphone, see Lowest-Cost Smartphone Service Plans. Especially for occasional, infrequent, or low-usage mobile phone calling or keeping a backup or second mobile phone, prepaid no-contract plans offer the best value. The most economical plan depends on your average monthly usage, as summarized in the following table. Also, T-Mobile family plans offer unlimited talk, text, and web at reasonable monthly costs per line: $50 for a single line, $40 each for a family of two, $30 each for a family of three, $25 each for a family of four, or $22 each for a family of five. You and your friends can form your own "family" and share the savings. Each line comes with 500 MB of high-speed data per month, after which the speed is reduced for the rest of the month; you can purchase more high-speed data if you need it. Some companies such as TracFone and Jitterbug specifically target low-minutes users such as children and seniors. However, for the lowest costs, the following service plans are recommended. No contract, no credit check. You pay first and then call. Quit any time. You must add money periodically to keep your account active. Unused prepaid time left over at the end of each period rolls over to the next period. Phones start at $20 (such as the Samsung T139). You must add at least $20 once a month, which includes 400 minutes of calling, to keep your account active. Unused prepaid time left over at the end of each month is lost. You must add at least $30 once a month, which includes 1500 minutes of calling, 1500 texts, and 30 MB of Web data. If you will be calling more than 1500 minutes per month, consider the metroPCS $40 per month plan, which offers unlimited talk, text, and web access for $40 per month or $35 per user in their Family Plan. A family means two to five users. You and a friend can form your own "family" to get the lower rate. If you use your phone a lot on some days and not at all on others, consider T-Mobile's Prepaid Pay by the Day plans. For example, you can pay just $2 per day for unlimited talk, texting, and Web access at 2G speeds. You'll need to add at least $10 every 90 days or $100 once per year to your prepaid account. This is the lowest-cost plan for an emergency or backup phone, or a phone that you use no more than 25 minutes per month on the average. You pay 33 cents per minute for all calls, 24 hours a day, seven days a week. To keep your account active, you must add at least $10 once every 90 days, which comes to about $3.35 per month. To pay only the minimum cost, you can call up to 10 minutes per month. Sending or receiving a text message costs 10 cents. Any unused minutes roll over to the next 90-day period. For example, if you don't use the phone at all for six months, you will accumulate 60 minutes of calling time. You could then talk for 60 minutes and still keep your monthly cost at $3.35. This plan is good for a backup phone to use when your main cell phone is lost, broken, stolen, out of charge; or an emergency phone for the car. Some people use a cell phone only occasionally, for personal business: "I'm running late" and "Where are you now?" In that case, this low-usage plan can be the most cost-effective. If you seldom use your backup phone, be sure to turn it on and check it at least once a month. Batteries gradually lose their charge over time, even with the phone turned off. After you spend $100 on this plan (which will take about 2-1/2 years at the minimum cost), you will reach the Gold Rewards level. That means your per-minute cost drops from 33 cents to 28 cents per minute, and more importantly, you only need to add money once per year instead of once per 90 days. That means you can just add $10 per year (83 cents per month) to keep your backup phone working. If you don't make any calls on your backup phone for 2-1/2 years, you will accumulate 350 minutes of calling time. If you later decide you want to use the phone more than 25 minutes per month, you can add $100 and bring down your per-minute cost to 10 cents, as described in the next section. This convenient, low-cost plan is ideal for average usage of 25 to 200 minutes per month. You pay 10 cents per minute for all calls, 24 hours a day, seven days a week. Sending or receiving a text message costs 10 cents. By adding $100 (1,000 minutes) to your account, you immediately reach the Gold Rewards level. That means you need to add money only once per year. Your first-year cost is $100, or $8.33 per month, assuming that you don't use up 1,000 minutes over the course of the year, an average of 83 minutes per month. After one year, you need to add some money, but how much? You can add another $100, which pays for another 1,000 minutes. Alternatively, you can add less than $100, but that increases your per-minute cost, as shown in T-Mobile's Gold Rewards refill value table. In either case, you carry over the unused leftover money in your account and won't need to add any more for another year. You must add at least $10 per year to keep your account active. For example, suppose that at the end of the first year you still have 400 minutes remaining. You probably don't need 1,400 minutes for the next year. So instead of adding $100, add just $50. This increases your per-minute cost from 10 cents to 11 cents, but your ongoing cost for the second year is just $4.17 per month. 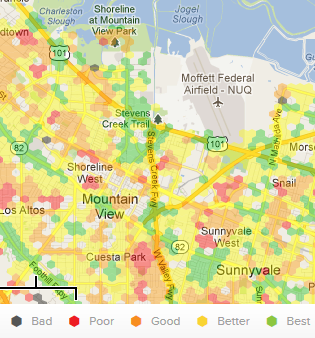 For a local coverage map, see the T-Mobile Personal Coverage Check web page. Note: In December 2011, AT&T dropped its plans to acquire T-Mobile. This is good news! T-Mobile will continue to offer low-cost prepaid plans and maintain competition between the major cell phone service providers. This plan is good for usage between 200 and 500 minutes per month. You add $20 per month, which includes 400 minutes of calling. Any unused minutes at the end of the month are lost. Additional minutes beyond the prepaid 400 are just 10 cents each, unlike the punishing over-usage rates typically charged in conventional monthly plans (AT&T and Verizon charge 45 cents per minute). One disadvantage of this plan is that only talk, not texting, is included in the $20 monthly fee. Texting costs 15 cents per message. If you plan to do a lot of texting, consider their 1500 talk & text plan, described below. You can change plans at any time. If you lose or break your phone, you can buy a new one for as little as $5 (the Kyocera S2100 as of June 1, 2013) and transfer your account to the new phone, at no additional cost if you do it yourself online. Virgin Mobile uses the Sprint network. 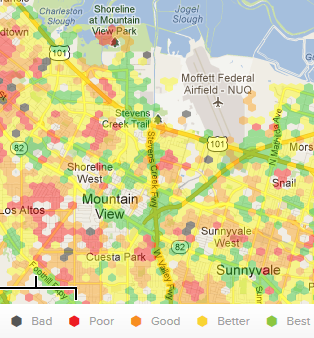 For a local coverage map, see the Sprint Coverage Check web page. This plan is good for usage between 500 and 1500 minutes per month. You add $30 per month, which includes 1500 minutes of calling, 1500 text messages, and 30 MB of Web data. Any unused minutes at the end of the month are lost. Additional minutes beyond the prepaid 1500 are 10 cents each. If you lose or break your phone, you can buy a new one for $15 (such as the LG 101) and transfer your account to the new phone, at no additional cost if you do it yourself online. This review of low-cost cell phone service plans only considers domestic (U.S.) calling costs. If you are considering other services such as texting, web data, roaming, or international calling, other plans and carriers might offer better choices. For low-cost smartphone usage, see Lowest-Cost Smartphone Service Plans. T-Mobile and Virgin Mobile offer the best low-cost plans that I could find. I personally use the Virgin Mobile 18cTalk plan, which costs just $5 per month but is no longer available to new customers. My wife uses the T-Mobile Pay As You Go plan, starting with $100 and adding $50 at a time as needed, which costs about $8 per month on the average. My daughter uses the T-Mobile Pay As You Go plan, starting with $10 and adding $10 every 90 days, which costs about $3 per month. For more information and reviews, see the consumersearch article Prepaid Cell Phone Plans: Reviews. Also see the Prepaid Reviews web site, which provides an overview and lists the "pros" and "cons" for many prepaid cellular service providers. As you shop for a mobile service provider, you should check the quality of wireless coverage in the areas where you plan to use your phone, such as your home, work, school, and travel areas. One good place to check is at www.rootmetrics.com. Go to the Root Metrics website and click "Check Coverage." Enter your location, then choose the carriers you are considering. 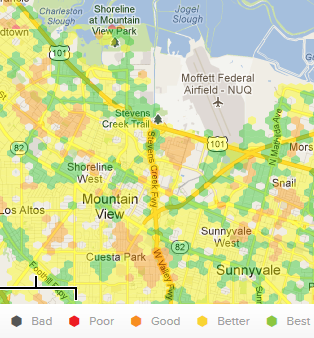 A color-coded map shows the signal quality in that area. You can choose to display signal quality alone (for making calls), data speeds alone (for smartphone web access), or both quality metrics combined. 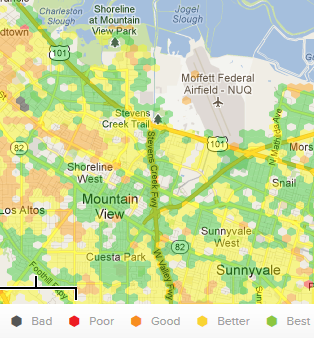 The following examples show the coverage in the Silicon Valley, California for four popular providers: AT&T, T-Mobile, Sprint (which is the network used by Virgin Mobile), and Verizon. Coverage in your area could be different, so check your particular location to get relevant results.